Sail photos by Steve Boulton, Millwright. Mill photos by Simon Heath, Museum Trustee. Concrete floor in process of being removed. It will be replaced by a more sympathetic wooden floor. Scaffolding has been erected for the removal of the external rendering. Patches of rendering removed exposing the clunch beneath it. The weather was perfect on Wednesday morning (13th March) when the cap was finally lifted off Burwell Mill. A hugely supportive crowd of local people, mill enthusiasts, Friends of the Museum and volunteers turned up to watch (including a class of fascinated under-fives from Burwell’s Spring Close Montessori school) and were served tea and cakes from the viewing point on Mill Close. First the temporary roof was swung over the Mill by the mobile crane, looking like a shot from a sci-fi movie against the bright blue sky. An hour later, after much hard work by the millwrights Neil and Steve, the cap was tenderly lifted off by crane driver Darren, and set on the ground to cheers, whistles and applause. Anne Mason, Heritage Lottery Fund Committee Member for the East of England, gave a excellent speech about the Fresh Wind in Our Sails project which was enthusiastically received. It was a great day, and thank you to everyone for your support! Photos of the day are in a slideshow below. Earlier in the week the two millwrights, Neil and Steve, made preparations for lifting the cap off the Mill to ground level, an operation that was achieved on Wednesday morning in near perfect weather conditions. 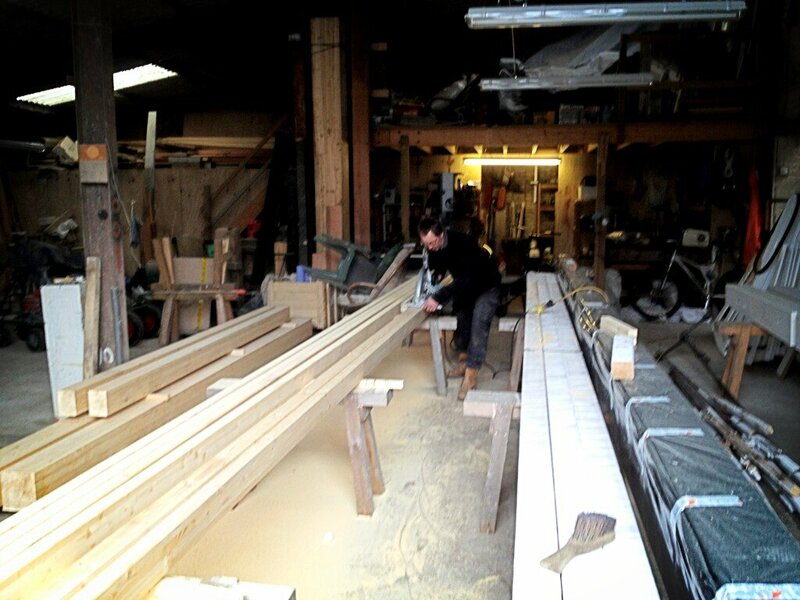 The first task of the week was to assemble the temporary roof to keep the mill dry until the cap can be refitted later in the year. This is a light timber lid with a small eaves overhang that is covered over with roofing felt. 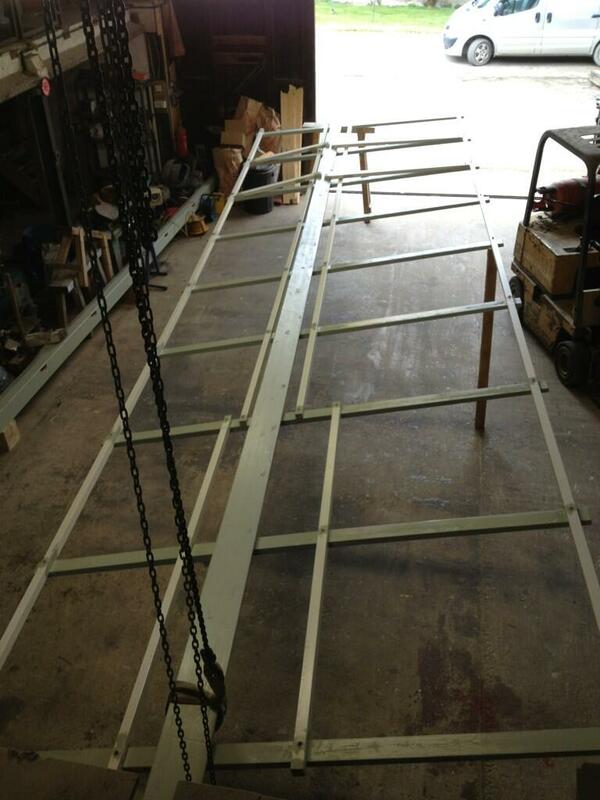 An important element of the lid is a hatch to allow the four lifting chains to be attached and detached. The temporary roof was brought to site in sections and assembled in front of the mill where the cap was due to land. A 45-ton capacity four-wheeled mobile crane arrived on site early on Wednesday morning, driven by Darren of Welch’s, Cambridge, who works with many local mills. Soon after 8am, the crane took the strain as the temporary roof was lifted high over the mill to create more space in the compound. One of a pair of millstones displayed outside the Mill was also lifted out of the way by mechanical means. Back at the top of the Mill, the storm hatch at the front of the cap was removed. A chain hanging from the crane hook was then attached to the empty cast-iron poll end of the windshaft. Inside the cap, several straps had been added to prevent the windshaft lifting free of its bearings when tension was applied to the front hanging chain. Two more chains were connected to the projecting sheer overlays that form the fan stage at the rear of the cap, forming a three-point lift. Adjustable pulley blocks on each of the three chains allowed the millwrights to level up the cap precisely as the crane gradually took the weight of the six-ton structure. Two control ropes reaching to ground level were tied to the cap at front and rear. As it was slowly lifted clear of the tower shortly after 9.30am, the natural rotation of the cap in the light breeze was checked by assistants holding the control ropes. The cap hovered approximately one metre above ground level for several minutes while a supporting nest of timber blocks – looking like a large Jenga set – was constructed. Its final few centimetres of descent were covered at a snail’s pace with the millwright checking all sides to ensure that the cap’s internal frame rested evenly on its new foundation. After a well-earned cup of tea, the temporary roof was lifted on to the tower and securely strapped to the internal beams to prevent it lifting during gusty conditions. The final craning operation was to lift the six-bladed fantail from its bearings at the rear of the cap and lower it to ground level so it could be dismantled and repaired. A large crowd of visitors, refreshed with cakes and tea laid on by the Museum, watched the lifting operation. Those who arrived with seconds to spare were greeted with the sight of the cap in mid-air as they approached. 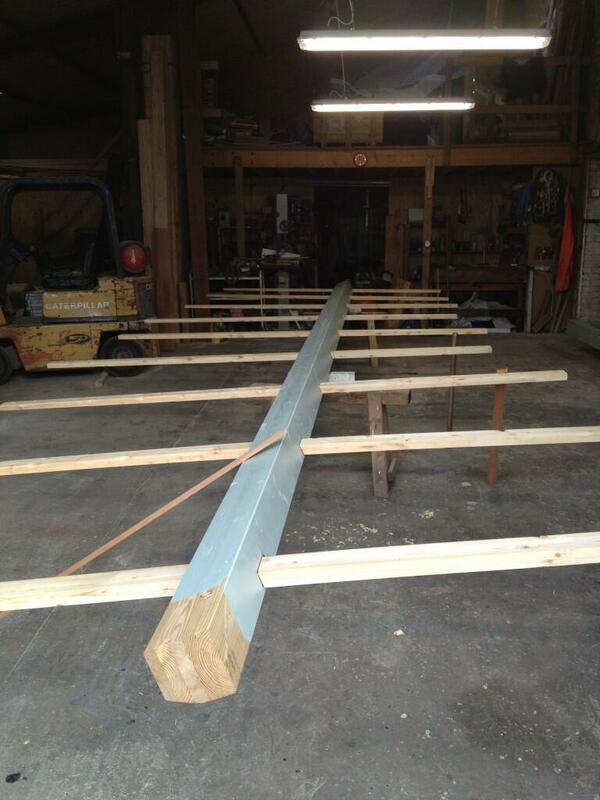 Once at ground level, the condition of the aluminium sheet covering and fan stage timbers could be inspected. Among the visitors was Chris Wilson, restorer of the windmill at Over, who had been commissioned to rebuild the cap in situ and install the aluminium covering in the late 1970s. Chris was pleased to see his handiwork still in a serviceable condition after 35 years’ exposure to the elements, and brought with him some wooden patterns for the metal components of the fantail gearing that he had made. 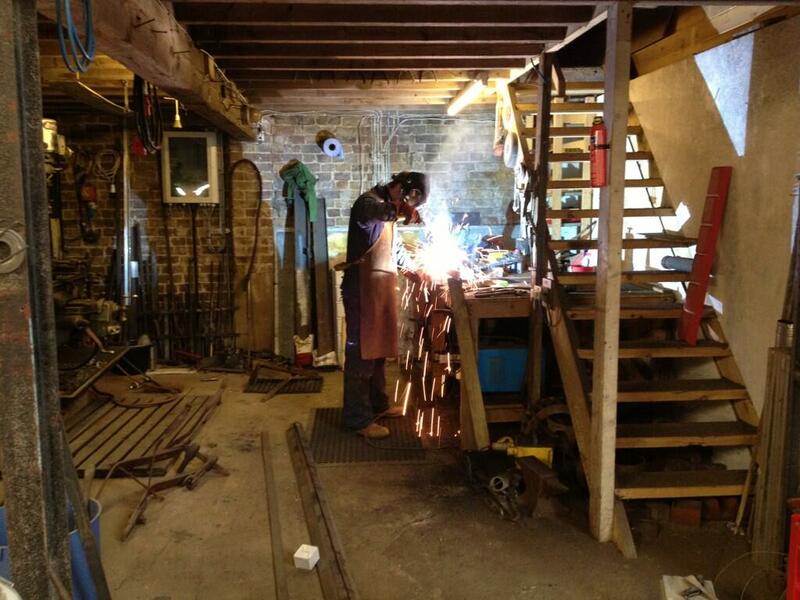 With the cap now accessible at ground level and new sails under construction at their workshop, the millwrights have plenty of work to get on with and have already made excellent progress. Over the coming months the aluminium sheeting will be stripped from the cap rafters, the fan stage will be repaired and the fantail gearing will be overhauled. New cedar weatherboarding laid vertically over the rafters will return the cap to its traditional white-painted appearance. The result will be stunning and is eagerly awaited. 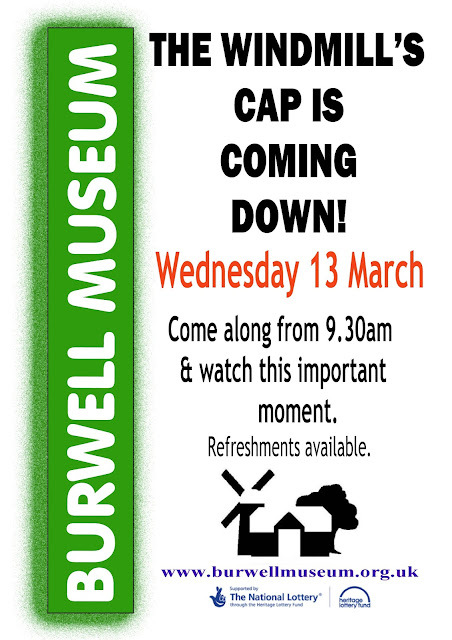 The big day has finally arrived – the cap is being lifted off Burwell Mill by a 65-tonne mobile crane from 9.30am. It’s a historic day for the village, so please come along and bring your friends and family – refreshments will be provided. All are welcome! 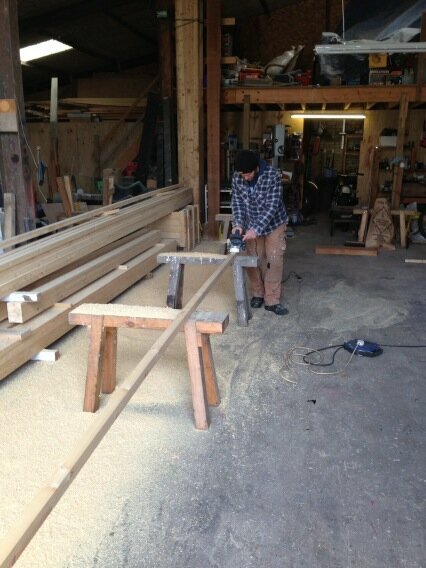 Getting the cap off the Mill is no easy matter! During the lifting operation, the crane’s extending boom will be positioned high above the Mill. The 6-ton cap will be lifted off and placed on the grass beside the Mill. Finally, a temporary flat roof will be placed on top of the Mill, to protect it from rain while repairs are being carried out. 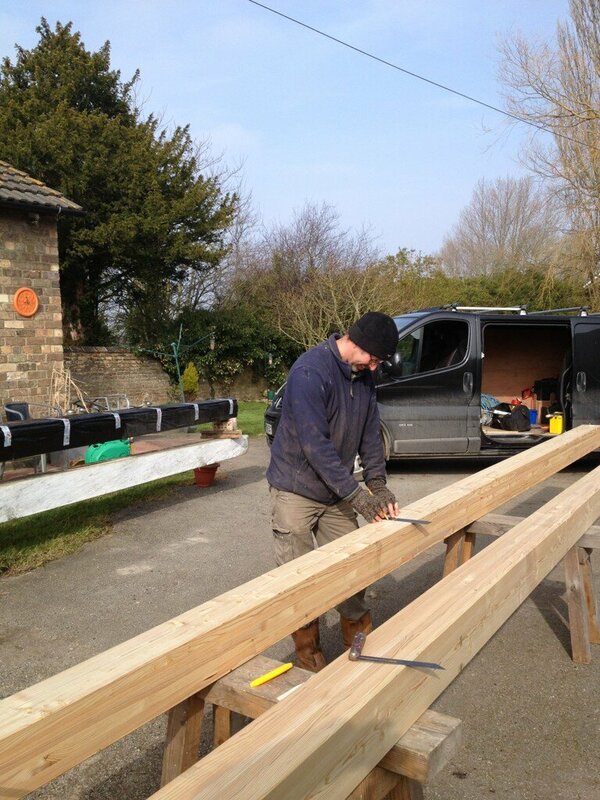 It’s part of the Fresh Wind in Our Sails restoration project, funded by the Heritage Lottery Fund (HLF). Anne Mason, HLF Committee Member for the East of England, will be in attendance during the morning, and will say a few words about the event and the Fresh Wind in Our Sails project. 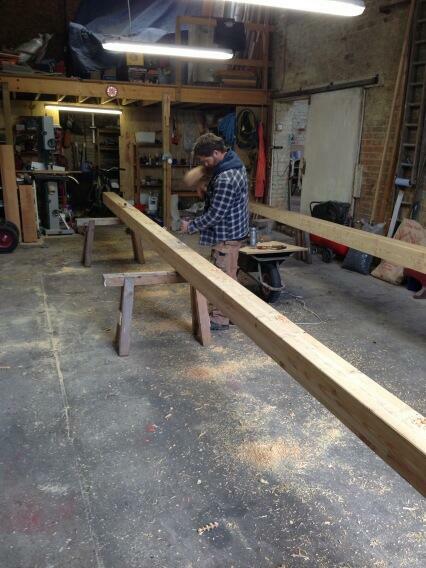 Neil marking out the laminated whips for the first new pair of sails. 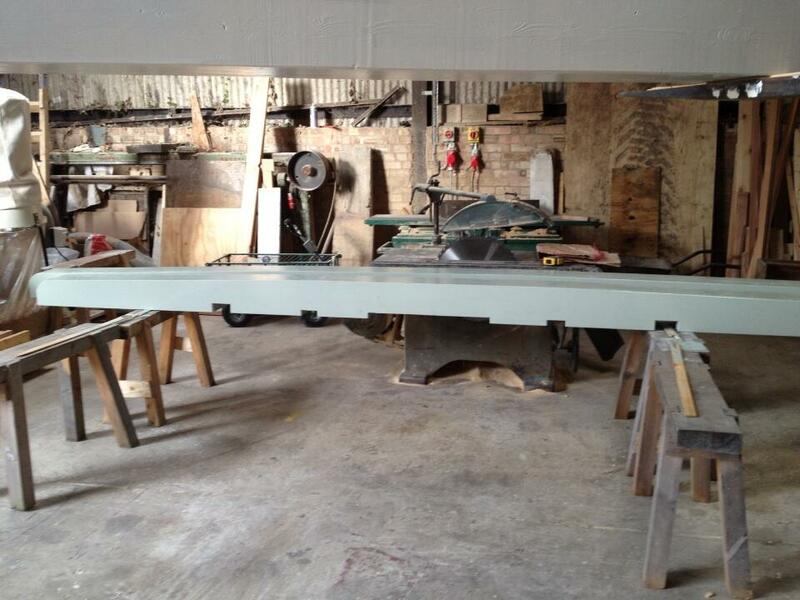 Come and watch the cap of Stevens' Mill being removed as part of the Heritage Lottery funded restoration. From 9:30am on Wednesday 13th March.